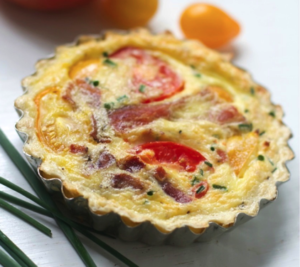 An easy home made bacon tomato quiche using tortillas to make the piecrust. Spray pans or use oil for tart pan. If using raw tortilla as I have, cook first 15 seconds on each side, browned. Place tortilla in start pan. Cut off what is left over. Mix together eggs, cheese, cream, bacon, and chives. Season with salt and pepper. Place chopped tomatoes in pan. Bake for 15-20 minutes at 375 degrees or until quiche no longer jiggles.